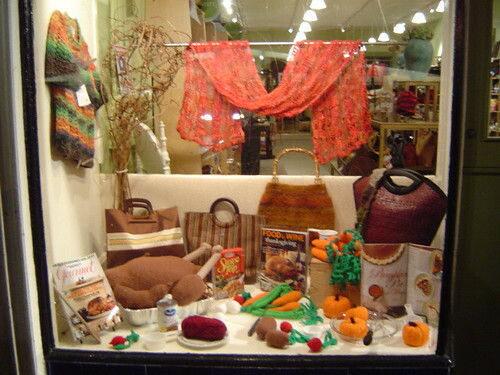 Last night I did the latest Noe Knit window. This one is all about making Thanksgiving dinner. I was a little worried that it wasn’t going to be very good but I had some fun with it & think it’ll have a few people stopping. I wish I could say I did all the knitting myself but I only did the pumpkins. Since I was so busy this past month Matthew from my knitting group took over & did all the vegetables & the amazing turkey. The vegetable patterns came from Magknits though he tweeked some to make different ones. Now I need to start formulating plans for a Hanukkah window & a 12 Days of Christmas window. Ideas welcome! 12 years ago by Kat in Holiday , Knitting , Needlecraft | You can follow any responses to this entry through the RSS feed. You can leave a response, or trackback from your own site. 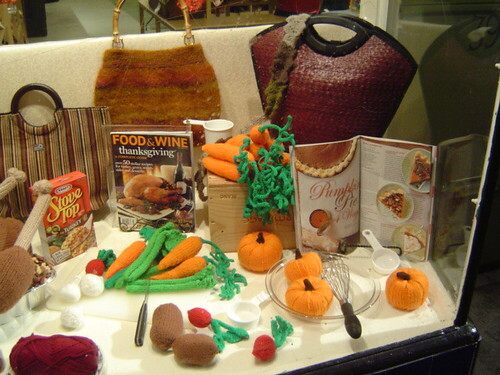 Noe Knits must have the best window display in the city- you always come up with the best ideas! Wow. That is fabulous!!! You did a great job. The little pumpkins are adorable. The turkey still makes me laugh! You always put together the most fun windows! awesome window display! So much effort has gone into it, it’s great. For Hannukah, maybe dreidls and gelt (obviously) and felted blue, white, and yellow stars? I’d say I’d lend Noe Knit my menorah, but it’s my mom’s and I don’t think that would go over so well. OH! And potato latkes. I definitely think we should have some knitted potato latkes. If we have those, I will drool everyday when I come in for work over winter break. A masterpiece, as usual. 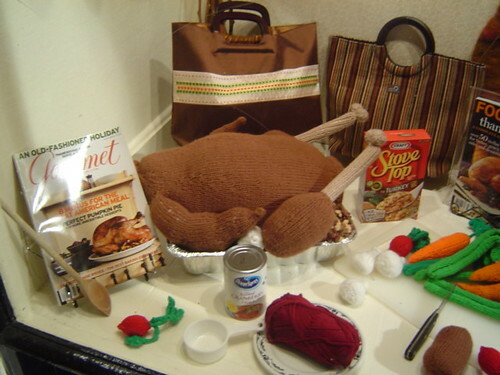 Like the previous poster, I too love the skein of wool as the cranberry sauce – save a slice for me! Any possible way to share that turkey pattern? I just love it! I am going to a Thanksgiving dinner I would just love to bring that to – please let me know if you can share the source of that pattern. Thanks!